Sourdough bread, bread that is made entirely from natural yeasts, begins with flour and water. Millions of tiny molecules made of natural wild yeast covers the surface of the wheat, filters through the air and covers the baker’s hands. When flour and water is mixed then left to sit, these molecules begin to spontaneously ferment. It is the bakers job to feed this mixture in a predictable pattern to create a lively community of microorganisms. Feeding this “starter” with flour and water in a regular pattern allows for healthy growth of the bacteria and plenty of sugars (for food) to stay active. This mature “starter” is the natural leavening agent needed to begin the process of making sourdough bread. The starter needs a 1:1:1 ratio of fermented starter : water : flour. There is no commercial yeast used, no hard kneading of the dough, and there are no added ingredients. 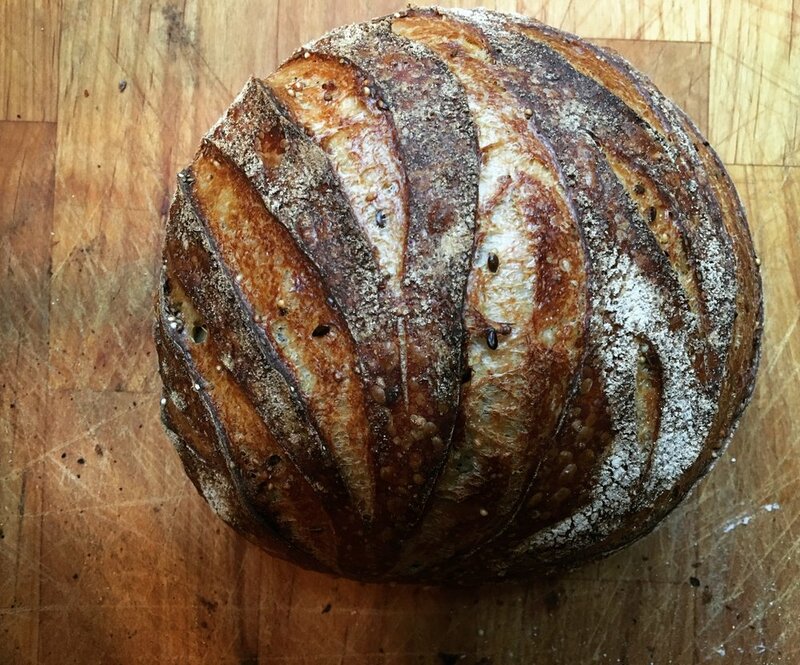 Naturally leavened bread, or sourdough bread, is fermented in different stages to create an airy and delicious food. Each step of fermentation transforms the wheat into something wholly nutritious for our bodies. Inside the wheat grain there is a nearly complete protein, carbohydrates, minerals, all things you need to sustain a complete life. The bacteria in the starter, commonly known as lactobacillus, is a probiotic that lives in the starter and is the fundamental principal to leavening bread naturally. Sourdough bread contains a higher percentage of lactobacillus than yeast, which results in more lactic acid production. To properly absorb the nutrition that bread hosts for our body, we have to know how to get to it. The outside of the grain is coated in phytic acid, which is difficult on our digestion. The lactic acid created from the starter helps to counter this potentially dangerous phytic acid, providing more mineral availability and easier digestion. This phytic acid coating happens to be present on all grains, nuts, seeds and legumes. Soaking these grains, nuts and seeds will break down the acidic coating. We then can hack into the nutrients provided for us from these foods, especially protein, which is not accessible without fermenting the grain. The process of naturally leavened bread allows the protein molecule, gluten, to relax and allows the fermentation to create the rise in the bread. The bacteria created from fermentation breaks down the carbohydrates. The bacteria and yeast combination predigests the starches in the grain making for easier digestion. The lengthy preparation of sourdough allows for the gluten to be broken down into amino acids making digestion easier, especially to those who are sensitive to gluten. When baked, the starches become gelatinized and the bread is now more digestible. Acetic acid is also created in the fermentation process, and as a mold inhibitor this helps to preserve the bread naturally. Gluten becomes very tight in commercially made bread. This bread is kneaded fast and hard to develop the gluten strands quickly. Commercial bread also includes active dry yeast, helping to create a big rise in a short time. During World War II commercial yeast began its rise. Instead of waiting for the bread to rise naturally, many loaves of bread could now be made in a very short period of time by isolating the yeast and adding more to the dough. Commercialization of bread was born. It was a simplification of the bread making process; vital nutrients from the bread became less available to the body and made the bread harder to digest. Gluten development is necessary to make bread; as fermentation develops, air bubbles develop inside dough. Gluten holds the space for the air bubbles, but if not for the gluten they would escape. This would result in a very dense and flat loaf of bread. The air inside these bubbles is released while baking, creating pockets in the dough. The challenge with making bread with gluten free flours is finding the right flour that will mimic gluten characteristics; bread is mostly air. It is in the slow and natural process of the fermentation with the presence of yeast that creates the acetic breakdown. Bread without this fermentation becomes hard to digest and when things are hard to digest, it taxes the body. If you know someone or you yourself love bread but avoid gluten, wheat, or bread varieties in general, give this bread a try and see how it goes. You may not be the first to be pleasantly surprised that you can eat this bread and feel great. More bread more love.